Disney is preparing to change the game later this year with its exclusive streaming service, Disney+. Not only will this new service have a massive library of classic Disney, Star Wars, Marvel, and Pixar titles, but it will also feature plenty of new originals. 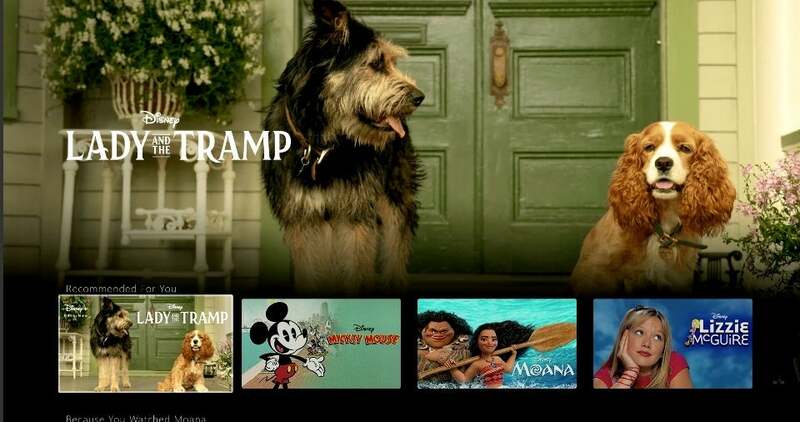 This will consist of both movies and TV shows, and we finally have our first look at the first original film coming to Disney+: The live-action remake of Lady and the Tramp. On Thursday, Disney shared a lot of information about its new streaming service, with direct to consumer chairman Kevin Mayer showing off the user interface of Disney+. During his presentation, Mayer showed a couple shots of the Disney+ homepage, and one of them contained a photo from Lady and the Tramp, with both of the lead characters front and center. Take a look at the new iteration of Lady and the Tramp below! This new take on the animated classic will be available for streaming on Disney+ when the service launches later this year, though that specific date has yet to be revealed. Charlie Bean, director of The LEGO Ninjago Movie is taking charge of the project, which was written by Andrew Bujalski, and is being produced by Bringham Taylor. Lady and the Tramp will star Tessa Thompson, Justin Theroux, Janelle Monae, Thomas Mann, Kiersey Clemons, Benedict Wong, Ashley Jensen, and Yvette Nicole Brown. What do you think about this new Lady and the Tramp movie? Are you looking forward to Disney+? Let us know in the comments!